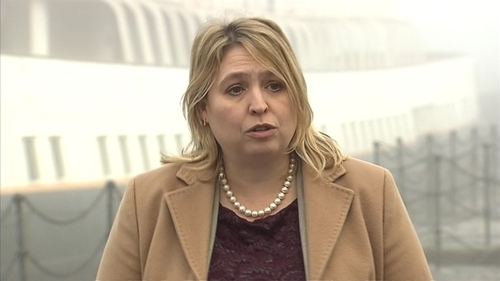 Ms Bradley said not having the institutions in Northern Ireland functioning as the 20th anniversary of the Good Friday Agreement loomed was a "hollow celebration"
Northern Ireland Secretary Karen Bradley has said she will not impose a framework deal or a timetable to resume negotiations on Stormont's deadlocked parties. Ms Bradley's comments come after Taoiseach Leo Varadkar last week called for a re-intensification of the stalled talks after Easter and suggested one way to break the impasse would be for the UK and Irish governments to table their joint view of what an agreement to restore powersharing might look like. While the Secretary of State said she was considering all options, she insisted her role was to "facilitate not impose" and said she had to be careful not to do anything that might make the process go "backwards". Speaking to the Press Association, she said: "I cannot tell two grown-up parties in the DUP and Sinn Féin, who are the two parties that need to make an agreement, to reach an accommodation and come to an accommodation to form a devolved government. "I cannot impose on them what that accommodation looks like," she said. "They have to do that themselves," she added. Ms Bradley said she did not agree with the time frame Mr Varadkar announced for after Easter. She said: "Putting artificial deadlines, putting barriers in the way, putting things that that stop the parties back together in place is not what we're about." She added: "That doesn't mean we're sitting on our hands and hoping it all goes right, absolutely not." Ms Bradley was in Washington DC and New York to mark St Patrick's Day. She said one of the things she had learned from the conversations she had in the US was the real desire to help. She said not having the institutions in Northern Ireland functioning as the 20th anniversary of the Good Friday Agreement loomed made it a rather "hollow celebration". "Whilst the unique power sharing arrangements that the Good Friday Agreement introduced have been ground-breaking and have delivered peace and prosperity that no one could have imagined in Northern Ireland, not having devolved government at the point of the 20th anniversary is, as Senator George Mitchell, who I've just seen, said, makes it a rather hollow celebration," she said. Mrs Bradley said she has spent the past nine weeks trying to get devolved government up and running, since she was appointed to the role. "We've reached a point where the two parties don't feel there's a lot to be gained from them continuing to talk to each other," she said. She said the UK government has been looking at what is needed to be done to ensure that things like public finances can keep running and keep functioning without the institutions and also get the parties back around the table. The ultimate aim was devolved government, she said. Ms Bradley said there was constant work being done across all levels of government in the UK government to get the parties back together. "I don't think it's right to try to speculate on timeframes," she said. She described her US trip as an exhausting but very rewarding and productive couple of days and it had given her a real determination to restore devolved government at Stormont. "We need to find a way to get there." She said she is going to reflect on whether the reinstallation of a US envoy might help the impasse. "It's something I'm considering," she said. "I want to reflect on some of the conversations I've had this week, thoughts on what a representative could do, an economic role maybe, and come to a determination." But she added: "I don't think we should assume that something worked in the past it's going to work now. "We've got to look at the situation we face today." Ms Bradley will visit Belfast this coming week.